My 25 Favorite Camp Fire Songs is also available for instant download! Save on shipping costs & receive your copy today! Order both Campfire books and pay only $25.00! “What's a camping trip without a fireside sing-along? 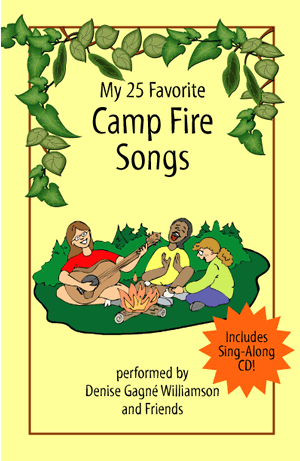 This campfire song book is guaranteed to get you singing along! This is the most user-friendly book and CD you can find, and comes in a convenient pocket book size that makes it highly portable. Musicians will appreciate the melody lines and guitar chords included in the song book. Non-musicians have clear examples of each song on the audio CD, sung in a true casual campfire style. Song and game suggestions are made for many of the songs throughout the book, and all lyrics are included. These songs are simple enough for young children to learn, and beautiful enough for more experienced singers to come back to again and again. All this for only $19.95! 17. Do Your Ears Hang Low?